We don't sell IP phones. Instead, we provide unbiased reviews so you can make the best decision for your business. 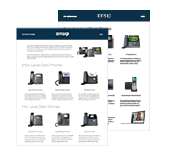 Our phone review team has compiled a list of our Top Business VoIP Phones. To see which brands and models we consider the best value, simply fill out a short form. The following review was conducted in December 2016. The first product in Grandstream’s new line of networking equipment is the GWN7610, a wireless access point, soon to be followed by the GWN7600. This device can be used to connect wireless devices to your local network. Grandstream, historically a manufacturer of IP phones, security cameras, and IP PBXs, is expanding its product portfolio to include networking and wireless equipment. This will provide integrators with end-to-end solutions for building out client business networks. The following review was conducted in October 2016, and information on subsequent software updates and new version releases may not be reflected within. This review predates OnSIP’s mobile app for iOS and Android, free to OnSIP users, so is not affected by bias. Counterpath’s Bria is one of the most recognizable softphones on the market. The app first was first developed for Windows and OSX users, offering an all-in-one solution that handled voice, video, and presence under a single roof. Since then, Bria has expanded across multiple mobile platforms, including smartphones and tablets running Android and iOS. There are more than 94 million iPhones in the US, never mind iPad tablets, so it's understandable why Bria would want to expand into the iOS market. The following review was conducted in November 2016. The following review was conducted in October 2016. The Yealink W56P/W56H is the second generation of Yealink’s DECT SIP phones, coming after the W52P/W52H. The phone is designed for on-the-go workers in industries such as warehousing, retailing, and catering, although you can use it in just about any context. Bria is a long-established softphone app produced by Counterpath. The app is now available on almost every mobile platform, including iOS, Android, iPad, and PC. We wanted to see how Bria for Android stacked up, so we had our team take it for a test drive. The following review was conducted in September 2016. Zoiper is an audio/video softphone app for desktop and mobile devices. It's currently available on Mac, PC, Linux, Android, and iOS. The softphone app is designed for a variety of users, including individuals, service providers, call centers, or any organization looking for a business grade phone app. In addition to audio and video calling, Zoiper also supports instant messaging, BLF, presence, and faxing. The following review was conducted in August 2016, and information on subsequent software updates and new version releases may not be reflected within. This review predates OnSIP’s mobile app for iOS and Android, free to OnSIP users, so is not affected by bias. Grandstream Wave is a free softphone app that aims to bolster remote working and replace cell phone services. Wave allows you to make and receive calls on your business or residential SIP accounts on any Android or iOS device. The app can operate from anywhere in the world with an Internet connection. Wave seeks to rid your phone of costly cell phone bills, relying on VoIP instead of aging cell phone networks.